It is a relief to see that the Liberal Supremo of the Americanist Church, Jesuit Thomas Reese, is "disappointed" with the "composition" of members of the upcoming Extraordinary General Assembly of the Synod of Bishops. The problem, of course, is that, since "Progressives" are unimpeded by shame or any qualms of conscience (let us call it the Modernist Taqiyya*), we never know if they mean what they say, or if they mean something quite different and just wish to gain new ground. For instance, Reese's ideas are certainly over-represented in the Synod by such luminaries as Kasper or Danneels, but he may still wish to paint the membership of the Synod as "too conservative" just to advance Modernist ideas. 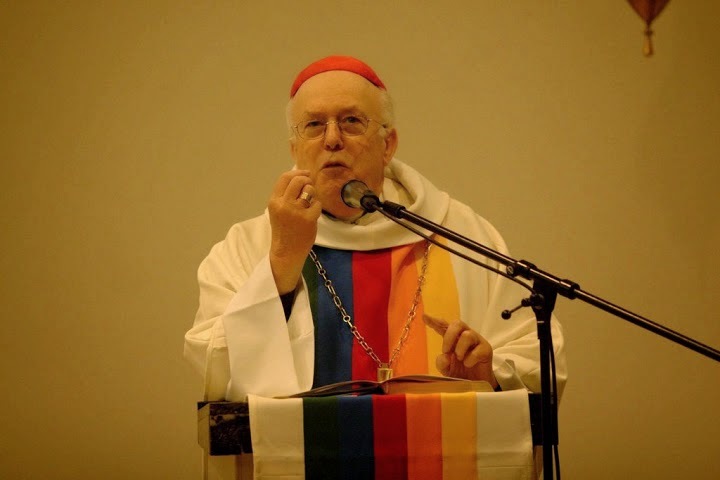 Which, of course, brings to mind the very presence of Danneels, the emeritus of Mechlin-Brussels: Danneels was directly responsible for the abuse of the spirit of Catholic children in Belgium during decades, against the crying pleas of Belgian parents (shocking report), and was naturally quite happy to support "homosexual marriage" just last year. And yet he is a pontifical appointee (the second in the list of pontifical appointees) of a Synod on the Family, when his only family expertise is on the destruction of children, marriage, and family. After Danneels had been replaced at the helm of the Belgian Church by a serious prelate, Archbishop Léonard, the latter made a strong speech on the shame of child abuse by priests, and the need for victims to end their silence. Encouraged by this message, four days after Léonard's brave speech, the Vangheluwe family was led to believe they would meet Léonard, who might encourage them. Instead, they were tricked into meeting Danneels, who tried to coerce them into keeping silence to protect his favorite pupil. At 3 p.m., the victim and some members of the family arrive. The nephew is surprised to see Danneels already in the room. He had expected to find the new Archbishop of Mechlin-Brussels, Abp. André-Joseph Léonard, the author of a powerful speech, on April 4, on the need to put an end to the realm of silence on child-abuse crimes in the Church. The others leave, leaving Danneels and the Vangheluwe nephew face to face. Their discussion - or perhaps we should say, their negotiation? - is startling. The beginning is filled with coolness. The victim begins: "Well, I was abused during my entire childhood by my uncle Roger. Sexually, and, even now, morally; and I feel that it is necessary that I react, that it is my duty to present my testimony before higher authority." An annoyed response by Godfried Danneels: "And what do you expect exactly? I already know this story, he's told me everything. It's not worth it to go through everything from the beginning, but what do you want me to do?" Kasper's presence is sad, but unsurprising. Danneels' is shocking and distressing. He is a one-man symbol of all that is wrong and wicked with the Hierarchy, the epitome of the worst meaning of the word "clericalism", the opposite of anything that could represent authentic reform and restoration -- a man who abused the spirit and annihilated Belgian Catholic families, and protected those who abused the bodies of children, a man who after leading Catholicism in his country into the ground should have been relegated to degradation and penance for the rest of his life yet still receives papal honor to influence a Synod on the Family! * It's right there in Pascendi, the great encyclical of Pope Saint Pius X: "They lie hid, a thing to be deeply deplored and feared, in [the Church's] very bosom and heart, and are the more mischievous, the less conspicuously they appear. We allude, Venerable Brethren, to many who belong to the Catholic laity, nay, and this is far more lamentable, to the ranks of the priesthood itself, who, feigning a love for the Church, lacking the firm protection of philosophy and theology, nay more, thoroughly imbued with the poisonous doctrines taught by the enemies of the Church, and lost to all sense of modesty, vaunt themselves as reformers of the Church; and, forming more boldly into line of attack, assail all that is most sacred in the work of Christ, not sparing even the person of the Divine Redeemer, whom, with sacrilegious daring, they reduce to a simple, mere man." The shamelessness of lying and deception is one of the things that made then, and have made since then, the triumph of Modernism so probable. They just pretend to believe, they lie, deceive, hide, they say the opposite of what they wished to say, all with the intent of advancing their anti-Catholic ideas. No, we are not exaggerating, these are exactly Pope Saint Pius' words: they hide their true intentions, they are mischievous, they are shameless (immodest) in their boastfulness, their doctrines are poisonous, they pretend they love the Church (while actually hating her and wanting to destroy her). **NCR published more of the transcript here at the time, though not that most damning last line by Danneels.